Since graduating in 2005, Pauline has continued to develop her techniques through additional training which allows her to offer treatments specific to the needs of her clients. Her treatments incorporate Swedish techniques, deep tissue work, stretching, trigger point release and myofascial release. During 2015 Pauline completed three advanced level Myofascial Release courses (level 1, 2 and pelvis) instructed by John F. Barnes. John is an internationally recognized physical therapist, lecturer, author, and the leading authority on Myofascial Release. The focus of Myofascial Release is to treat the cause of the problem to eliminate the symptoms and holding patterns, in order to make permanent structural changes to help you return to a pain free, active lifestyle. I believe in the body’s ability to heal itself and that massage is one of the many paths to restoring health and wholeness to the body. Pauline chose to pursue a career in Massage Therapy because it allows her to combine her interests in working on the human body with her passion for helping people achieve a pain free healthy life. It is also important to Pauline to provide her clients with a safe and comfortable environment. 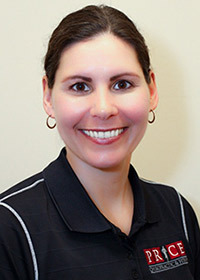 She strongly believes in continuing her education in order to stay current on innovative and effective musculosketal treatment techniques in order to treat a wide variety of conditions. In her spare time Pauline loves to go horseback riding at her parent’s farm, hiking with her two dogs and playing slo-pitch. She is happy to be a part of the multidisciplinary team at PRICE Chiropractic & Fitness because she believes a multidisciplinary approach is essential to maintaining health and becoming injury free. Stay Active and Enjoy Life! Pauline is always accepting new clients. We welcome feedback and reply to inquiries in a timely manner. Give our Waterloo office a call to schedule an appointment.